Four years after competing on American Idol, Scott MacIntyre travels the country, playing the piano, singing, and, in this case, performing for students who share? some of the same challenges he does. "Did you struggle when you were blind?" asked one student. "There were certain things I couldn't do growing up. I couldn't play baseball, I couldn't drive a car," he said. However, what he has done is nothing short of remarkable. "It's really cool to share that with younger people and tell them it is possible -- in spite of your circumstances, in spite of your biggest disappointments, your biggest obstacles, your biggest hurts -- you can reach your dreams," he said. Scott's dream came to life on the big screen during season eight of American Idol. "Life has been amazing since Idol," he continued. "I've gone on to release my first book called 'By Faith, Not By Sight.'" "She's amazing," Scott said, glowingly. They were just friends until after American Idol, when he called her up. "I said, 'Are you seeing anyone?' and she said, 'No,' and I said, 'Well, would you like to go out with an American Idol?' and she said, 'No,'" he laughed, explaining she went on to say, "'but I'll go out with Scott MacIntyre.'" After dating for years, the couple tied the knot and moved to Nashville. "I love hearing Scott sing. It brings me so much joy," said Christina. They are literally inseparable. In fact, Christina isn't just his wife, she's also Scott's road manager. "We're together, not 24-7, but you know, getting pretty close there," she said. Scott wouldn't trade? it all for the world. He said, "I've gotten to perform with some of my favorite artists that I grew up listening to -- Michael W. Smith, The Jonas Brothers, Alice Cooper." Scott has also been writing his own music, including a holiday album called "Christmas in Paris." He also has another new album coming out this year with a hit single called "Fifty Second Chances." Taking chances and succeeding, Scott MacIntyre continues to inspire people, far beyond his Idol days. "They'll literally say, you know, if he can do that, what could I be doing with my life? And honestly, that's what I want people to say." 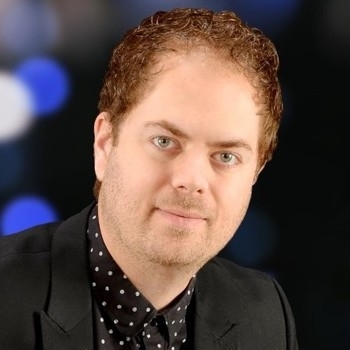 For information on how to book Scott MacIntyre for your next event, visit PremiereSpeakers.com/Christian/Scott_MacIntyre.